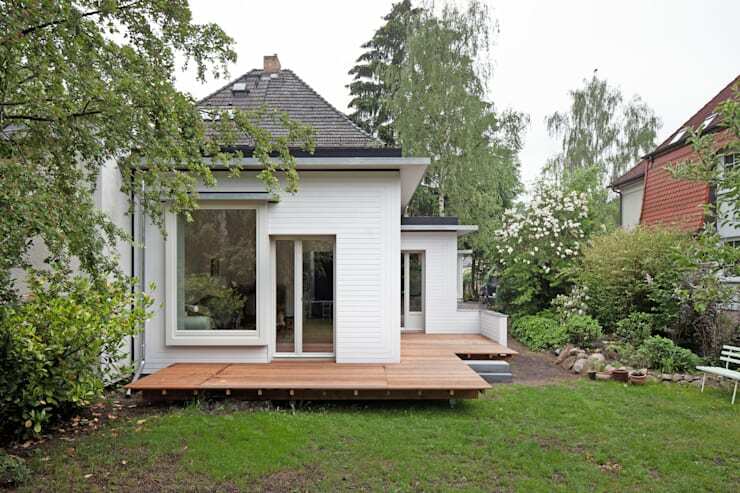 Today, we are going to visit Berlin where professionals Brand + Simon Architekten designed a beautiful light, spacious and bright family home that is not only in touch with nature but is as functional as it is stylish too. This understated design shines in its simplicity and we could all learn a thing or two from it. This is why we are also delighted to share the plans behind the house, showing you the strategy and organization went into the project from day 1. 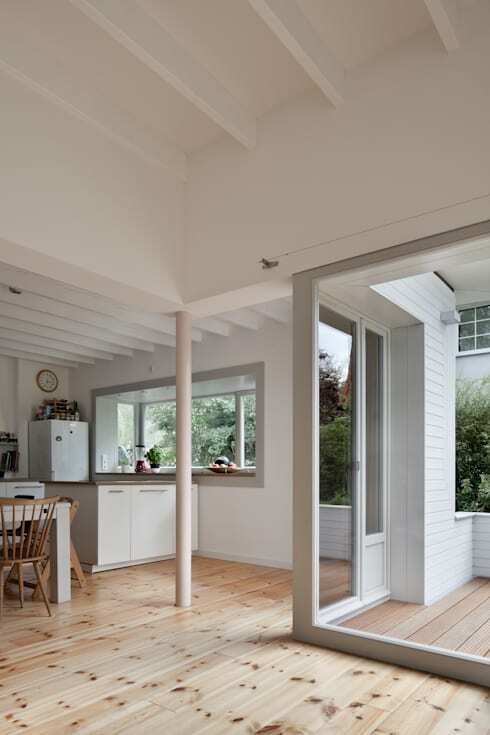 From the get go, we can see just how warm, welcoming and subtle this home is with white walls, a grey roof and a beautiful, light wooden platform. The platform wraps around the entire house, doubling up as a terrace. The home extends across the property in a beautiful and unique shape, with large glass doors and windows opening up the interiors onto the exterior spaces throughout. The beautiful garden is lush and expansive, offering the family plenty of space for enjoying the warm summer months, playing in the sunshine and hosting dinner parties or lunches outside. While it may look very natural, this garden has been very carefully designed and arranged, ensuring that it enhances the look and feel of the home. 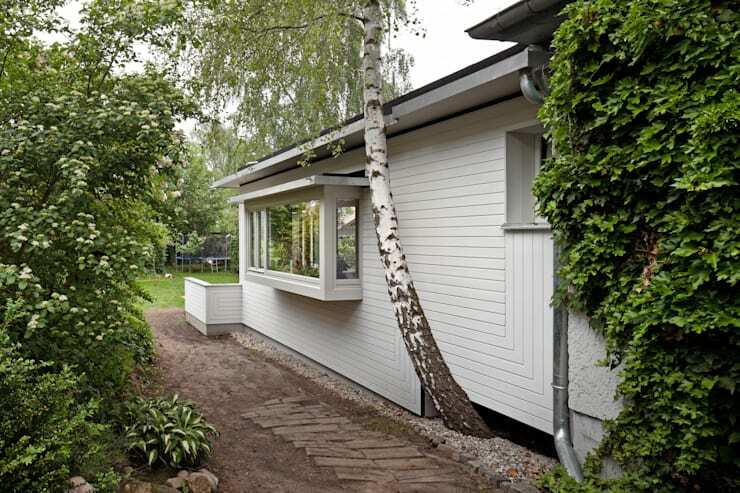 From this angle, we can see how a stone pathway runs parallel to the house, giving this space a very charming feature. The abundance of bushes, trees and flowers are every child's dream! Playing here would be liking playing in an enchanted forest. Invest in good gardening tools or a landscaper who will help you make the most of your garden space. The large glass windows and doors open up onto an open plan living space, where there is a seamless connection between the inside and outside areas. 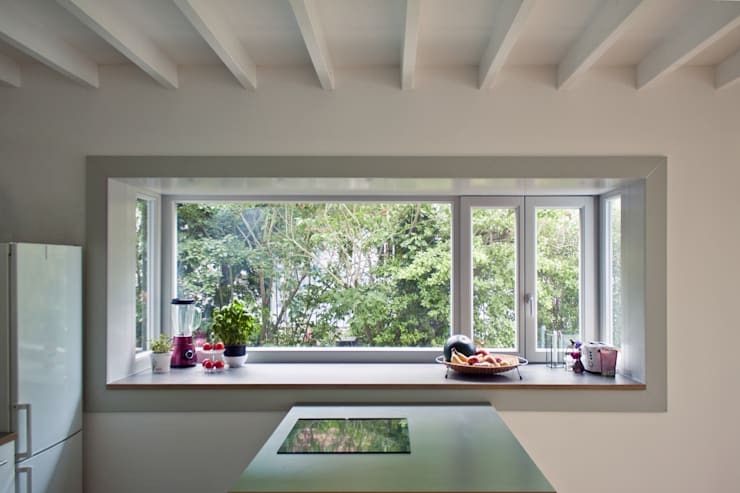 This allows natural light to flow into the home! 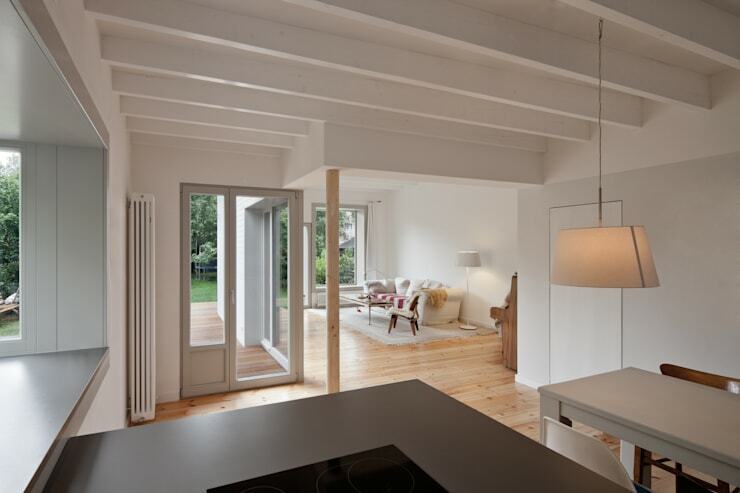 This is further enhanced by the light wooden floors and white walls, which reflect the sunshine so that the home is very spacious, homely and light. Remember that natural light can change the look and feel of any home, while naturally making it warmer. Have a look at these tips for bathing your home in natural light! The open plan living area is very appealing, creating social and interactive spaces where the family can spend time together. The neutral colour palette also envelopes guests and family members in its warmth and charm. You'll also notice that the modern design is complemented by a slightly minimalist, with only the most functional of items on display. For a family home, this is beneficial because it keeps everything neat and organized. Tip: Add a few lamps to an interior design, which will give the space a beautiful, soft glow with ambiance. The large glass windows and doors throughout also create a natural form of artwork, framing the beautiful garden. Couldn't you imagine whipping up a salad in this kitchen while watching the birds in the trees? You'll notice that these natural elements have filtered into the design of the home, with pot plants and vases of flowers used as decor elements. This is a great way to enhance a space without overwhelming it. Skylights are a wonderful way to introduce natural light into a room, without compromising on the privacy of the space. 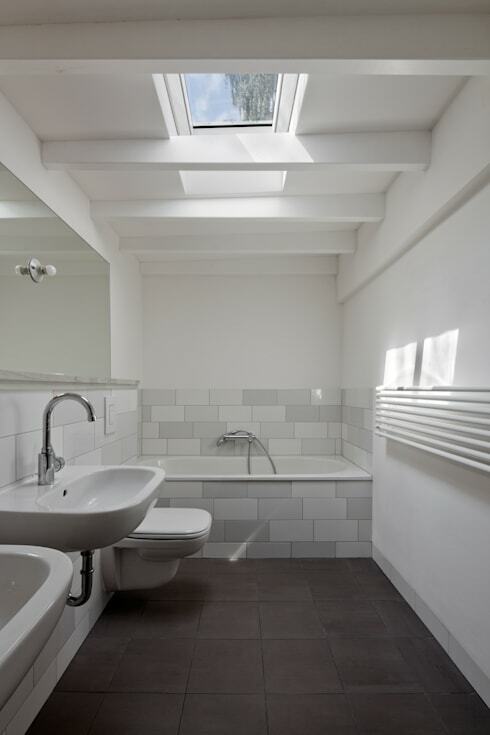 In the bathroom, we can see how the skylights allow sunshine to stream in throughout the day, yet the family have all of the privacy in the world. Speak to a professional about the possibility of installing skylights in your home. 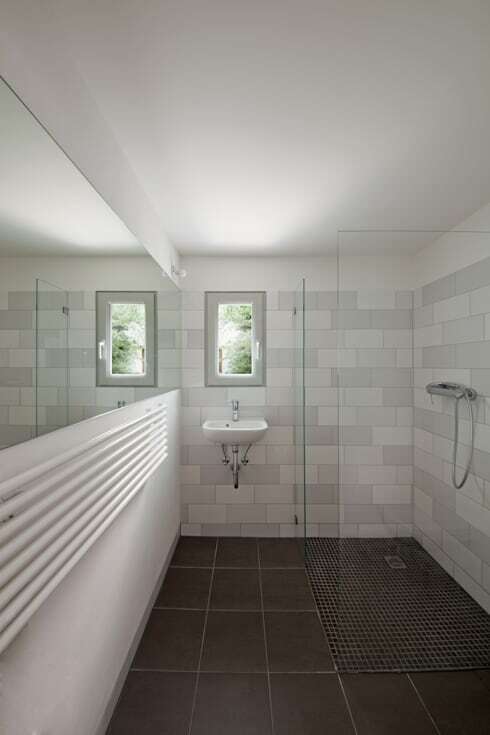 The bathroom is another example of functional and minimalist style, complemented by the chic, white style. Do you see how the different tiles and shades of white bring texture and tone to the space? A large mirror extends across the entire one side of the wall, making this room seem that much bigger and more spacious. This is a great design trick! Use a large mirror in any small room to giving the feeling of depth and space. And finally, we get a chance to see the plan! Architectural plans are wonderful as they allow home owners an opportunity to really envisage what a final product will look like. They can also see how the space is distributed. 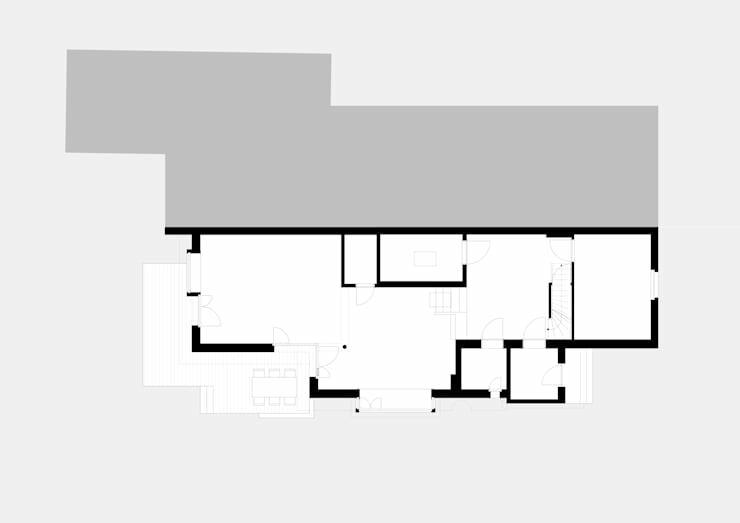 In this drawing, we can see all sorts of details including where the dining room is and which way the doors open up. Are you able to read it? If you've enjoyed this article, you'll love these 14 pictures of dream homes with their plans.